NO JOB IS TOO BIG OR TOO SMALL ... 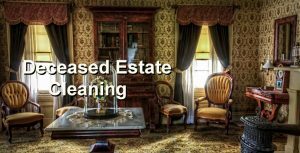 If you are looking for the right cleaner to assist with deceased estate cleaning, you can't go past Husband and Wife Cleaning team. We can do as little or as much as your like. We can assist with removal of furniture & other unwanted items and we can even organize a skip bin. We clean EVERYTHING from bathrooms, kitchens, bedrooms, verandas, cob webs, cupboards, flooring, windows, removal of odor etc. Call Sharen for a FREE in-home quotation.